Now, under the amended law, all those benamdars and the real owners, who have been indulging in bogus transactions since the period the original Benami Act was formulated, will find that there is no escape route if they are identified, for not only will they will have to forego property but their property will also be impounded by the government and, moreover, they will be liable to face imprisonment or penalty as the case may be. 1. 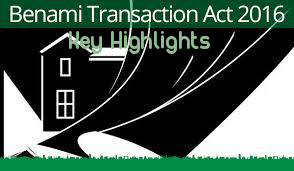 Persons indulging in benami transactions may face up to 7 years’ imprisonment and fine. 3. Initiating Officer may pass an order to continue holding property and may then refer case to Adjudicating Authority which will then examine evidence and pass an order. 4. Appellate Tribunal will hear appeals against orders of Adjudicating Authority. 5. High Court can hear appeals against orders of Appellate Tribunal.